To work in horticulture is a labor of love. One does not gain monetary wealth working in this industry. The other perks such as being around plants on a 40-acre site in the lush Columbia River Valley, on the other hand, go straight to the soul. I am blessed to not only work in horticulture but at one of my all-time favorite nurseries. Since moving to Saint Helens, I was hired by Joy Creek Nursery in Scappoose, just 10 miles down the road from us. 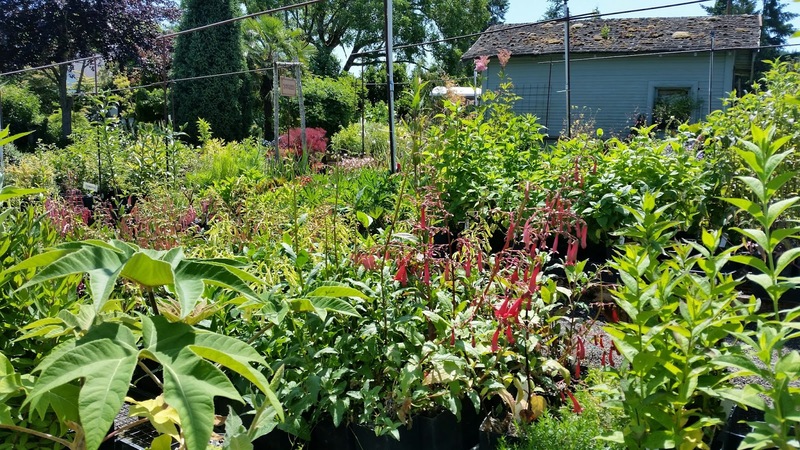 Maurice Horn and Mike Smith started this nursery 25 years ago, creating the kind of place they wanted to shop at but could not, at that time, find. All this time they have been propagating hardy plants appropriate to the Pacific Northwest. We also ship plants worldwide. It's really a local, small business with a handful of employees. Mike lives in the house on the grounds, and that must be quite an interesting life experience, to live in such a public place. Maurice is an expert in the genus Clematis as well as many others. I adore them both, as well as the whole staff. In that way I am also very wealthy. 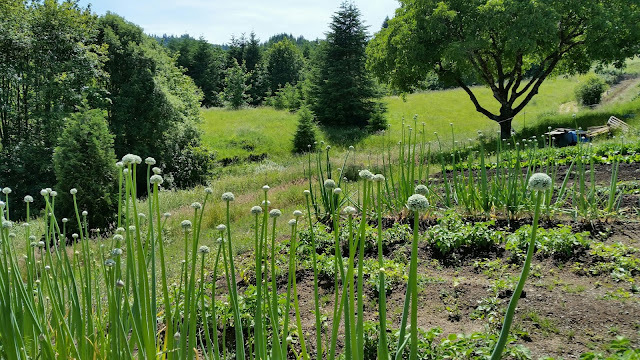 As I am also the "social media" person at Joy Creek Nursery, I take a lot of photos weekly and am fairly in tune with the changes each day brings to the four-acre display gardens surrounding the retail nursery. I would like to show you around from my point of view. Many plants I will show you are simply ones I like, not necessarily available for sale; some things are just not being propagated at this time and some things we just don't grow at all. But they are all wonderful, so come along with me and see what I get to see. OK, enough talk, let's look at photos. This is the scene I see every day just outside the office door. A native buckwheat blankets these rocks on a south-facing site. I fell in love with this plant and found a few in propagation, so one came home with me. I can only dream mine will look like this someday. The barn in the background is the checkout. It's also where all of the plants for shipping are packed and weighed, as well as a shelter from the excruciating heat and cold one experiences working outside. As I mentioned, there are four acres of display gardens in which to wander. One section is the dry border, another is a mixed and shady border. Still another area is filled with plants we use for propagation purposes. Actually, the whole garden serves that purpose. As I mentioned, Maurice is an expert in the genus Clematis. I am still learning the different species and have a very long way to go. I am, however, beginning to appreciate these vines and their many different forms. There is, I believe, one of these beauties appropriate for nearly every garden. This low-grower reminded me of hay blowing in the wind like waves. This is a very special one, the actual original plant Clematis integrifolia 'Rooguchi'; a gift to Maurice from its Japanese hybridizer, Kazuhige Ozawa. It is Maurice and Joy Creek that brought this to the U.S., something I only learned this week. It is now a very well-known Clematis and it is simply wonderful. Now, I'm also not much of a hydrangea person but there are several at Joy Creek that have me thinking twice. This incredible example is Hydrangea serrata 'Preziosa', an ever-changing shrub that is, as you can see, a multitude of subtle color that began as white, then pale green and now this. It also has the added benefit of fall color. Another fascinating hydrangea is this, Hydrangea aspera 'Macrophylla'. This beauty gets 15 feet tall, its leaves are felt-like and the bark is exfoliating. How wonderful is that?! Here is the bark on this beast of a plant. One very beautiful Hydrangea quercifolia 'Snowflake', a double-flowered beauty. I think I need a few of these in the garden. 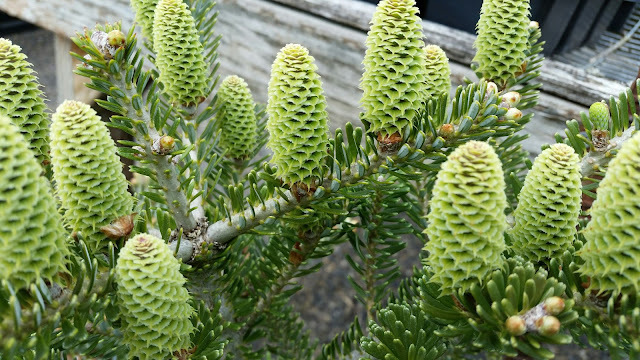 I am a huge fan of the quercifolia species. Hydrangea serrata 'Midoriboshi Temari', a very magic little princess of a plant. It simply twinkles. There are many other genera that Joy Creek specializes in: Penstemon, Fuchsia, Dianthus, Hosta and more but I'll save those for another time. Let's look around the retail area. This photo is one I see every day, it's the dry border section with the mixed border section in the background. Here is the barn and retail area as seen from the parking lot across the street. This was in early spring, it's much different today as many of the plants in the dry border in the foreground have filled out. We have a very talented colleague, Monica, who is wonderful at putting together the displays in retail in this rustic place. She has a whole barn of random rusted farm bits to use as props, as well as many fantastic planters, birdbaths and birdhouses from local ceramicists. Here, a Phormium takes center stage. A look at a few plants in the retail area: Romneya coulteri 'Butterfly'. Primula japonica with a Tetrapanax papyrifer in the background. The massive leaves of Gunnera manicata. A very sweet Sisyrinchium 'Quaint and Queer', it's such an interesting color combination that one came home with me this week after I saw it bloom, finally. I had been waiting for a long time, curious about the descriptive flower color of apricot and maroon. Philadelphus lemoinei 'Avalanche', a very floriferous plant indeed. Also in the retail area we have these very cool "fern tables", a woodland on a stone slab. So inventive, we even had their creator, Richie Steffen (curator of the Elisabeth Carey Miller Botanic Garden), out to teach a class about how to make these recently. Sedums! We have many. It's very tempting. 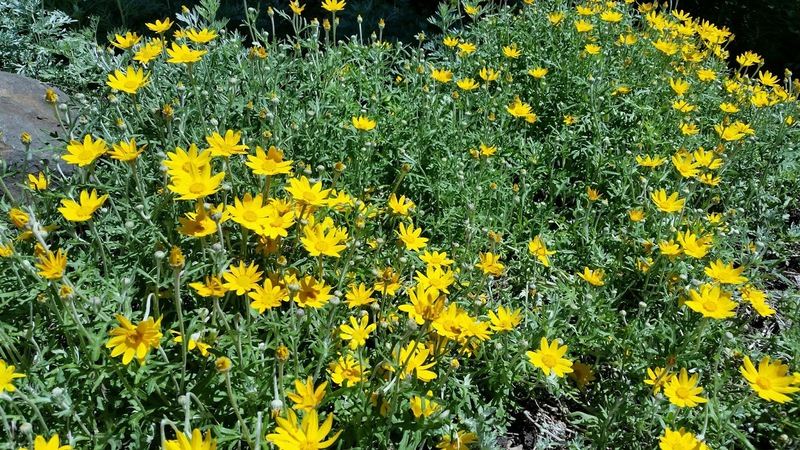 A variety of sunny blooms. Now for a look around the dry border. Here, along the driveway up to the nursery a variety of dryland plants get very little water. 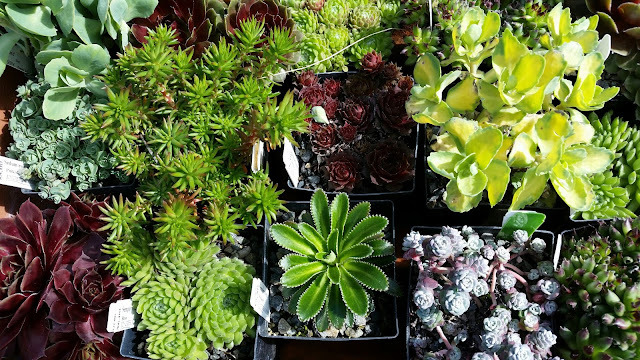 Yucca, manzanita, lavender and more thrive in the full sun. Stipa gigantea, giant feather grass. 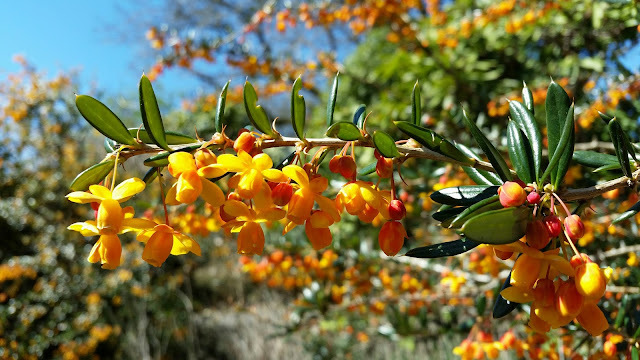 Berberis darwinii, blooming earlier this spring. Itea virginica in the borders just this week. This is a plant I had not heard of until working here, now I plan on planting one in my garden. It has the added bonus of fall color. One of several paths in this garden. On to the shady garden. This geranium, whose name I do not know, sparkles in the dark. A beauty of a shrub, Cornus alba 'Gouschaltii'. Fern at the gate to Mike's house. I do not know which this is, but it has incredible texture. I have enjoyed watching it unfurl for the last few weeks. It is a curious thing that many of the plant labels in the garden disappear, customers sometimes take them apparently. Souvenirs, perhaps? For whatever reason many plants are not labeled. I do, however, have the pleasure of a weekly walk through the garden with Mike where he points out plants that deserve attention and tells me their names. This is a ritual I look forward to weekly. So Mike, which fern is this? Hee hee. Thalictrum lucidum in the shade border. As well as a retail nursery, it is also Mike's home, a place where he grows some of his own food. He is very generous with this, too, for example we all get to munch on the most amazing raspberries every day now that they are ripening at lightning's pace. We can't eat them fast enough, there are so many! Amazing orange on a Knipfofia - we believe this might be a seedling, but it could also be 'Orange Crush'...in any event, this is in the propagation area and I want it. Along the edge of the parking lot is this beauty, Oregon sunshine or Eriophyllum lanatum. It's so cheerful and easy in full sun with good drainage. Just another sunny day in the mixed border retail area. Under the dawn redwood in the retail area. A foxtail lily or Eremurus, I don't know which one, growing in the sunshine. Cotinus 'Grace' doing her thing in the back edge of the borders. People rarely see this as it's in such a tucked away place, but it goes to show it's worth it to take your time to really look around. There are some odd things that happen at Joy Creek, too. This is a witch's broom, a fasciated bloom on a Veronicastrum virginium. It's supposed to be a spike of flowers, not a flat ribbon....how bizzare! 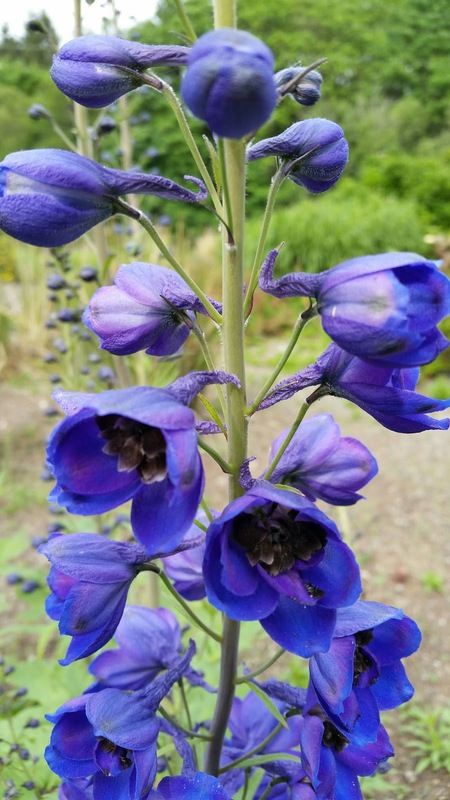 The bluest of blues in a Delphinium. This is also in the propagation area or I would have one in my own garden, be damned the high maintenance of this genus. Other strange things happen here besides fasciation. We get a lot of doggie visitors (as well as a multitude of eagles, cranes, hawks, kestrels, swallows, butterflies, bees, etc. etc.) but the furry ones are usually accompanied by a human counterpart. 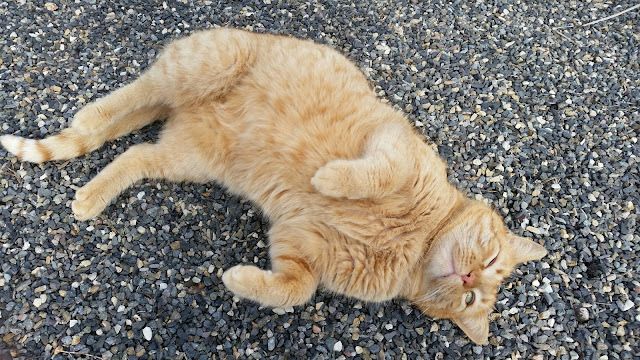 This sweet little gal showed up one day and just said hello. And did not leave. For two days. We all loved her dearly and looked for her family the whole time (while trying to work). After several "dog found" signs had been put up, her daddy came calling. She had wandered across the field, taking a real field trip of sorts. 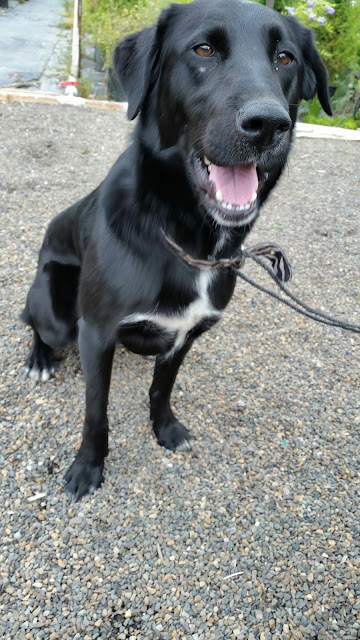 Turns out her name is Lacey and she nearly became my dog. Darn. Last but not least, the star of the whole show, the most important element to the whole shebang is Yowler. He runs the place, after all. He's a big mouse-scaring bowling ball of a cat (with fur) who gladly eats all the catnip you can dish out. Really, he's just a big muffin-head lover. Well, that's a small slice of what I get to work around every day. Some days are really hard in the 93-degree weather (or 41 and rain), moving very heavy flats of plants uphill in loose gravel. Other days you get to watch five bald eagles circle overhead. Most days you get a few jokes out of the crew, special days you are gifted a plant of some kind, sunny spring days usually yield some kind of fruit (strawberries, raspberries), lucky days you get a visit from Yowler and really lucky days you find him on your lap. That's only happened once with me and I cherish it. It's a true family of plant nuts all in one place. We share a common goal - to bring the most amazing plants to both our local community and thanks to our mail-order department, to the global community. I am so very lucky to be a part of this special nursery and I hope that you see a glimpse of that in this post. Yowler is gorgeous! Lucky to be working in such a plant treasure throve place! I feel very very lucky indeed. How very lucky you are to work in such a fab place. I've met Yowler and he has so much personality. I saw Richie give that same presentation at Dig on Vashon Island last year and it was great! I'd love to give it a try making one of those fab fern tables! Oh, that Yowler. He's my guy. Richie's fern tables are a miniature world unto themselves, so very magic. I would love to make one too someday. Maybe we could organize a blogger's fern table day?? It looks like the best workplace EVER (even with the weather issues). And I think every workplace should have an office cat or dog (or both). EVER is right! Oh yes, every workplace needs some furry friend to help out, for sure. Always fun to have a tour of such a gorgeous nursery from an insider, while I'm too far to visit in person I love to visit Joy Creek through blogs. I remember Alison's post on this nursery because Yowler was such a star. Yay! Lots of people have blogged about Joy Creek, I'm sure - Alison's is great. Joy Creek was one of my favorite stops on the Fling a couple years back. To be there every day must be wonderful! That fasciated bloom is pretty amazing, but it's just one of hundreds of really special things to discover there. So great! Every day something new to discover...really! It's a very special place to be sure. Mickey and Rosie's favorite nursery ! I think we'll have to come by for another visit . yay! Do come by again, we love the doggies! Horticulture is a calling, a love, I'm glad you're there -- for you, the customers, and the plant world at large. It is, Loree. You are too kind :) For me it soothes the soul. 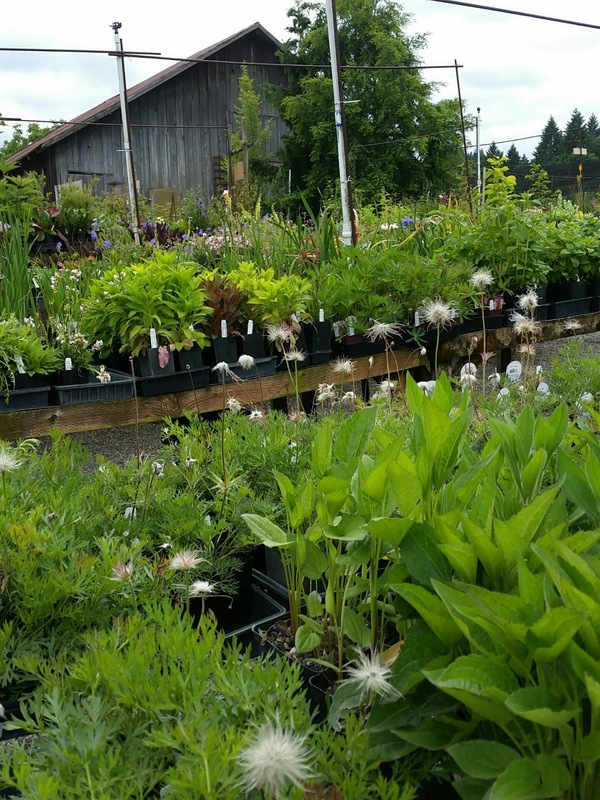 So many wonderful plants, that must be a great nursery to visit but also to work at. That cat is a beauty and I also should like to keep that dog who finally got his boss back after a nice trip. It is both, and I do both - work and shop. Oh, that dog, Lacey - you would have adored her. She was so well-behaved and knew some tricks, it was obvious she was very loved. I would have taken her in a minute. Gorgeous. Aren't you in your element. 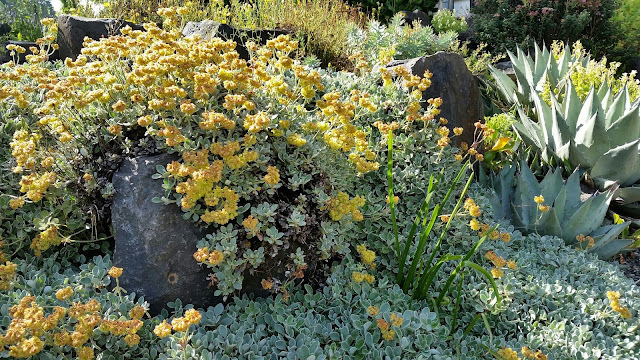 Also, what is that fabulous sedum with the daisy-like leaves and zigzag edges? I really MUST have that. Element! Yes...I am. The sedum you speak of is not a sedum, it's a Saxifraga - I will look up which one. Do you want one? We have a lot. I love Joy Creek, and you've just articulated some of what's in my heart. It's a special place. So glad they now have you there, too! What a fun post, Tamara. My question: Do ever bring home any actual money from your paycheck or does it all go to buying more plants? That would be my problem. :) Someday I'll come visit you. I really do want to see this lovely place. Thanks for sharing it. Oh, gosh no, Grace! It all goes to plants. Well, a lot of it does. Please DO come visit! Ricki and I both work here, it's a party every day! I'm so looking forward to more posts like these! I've visited a couple times, so could follow you around very easily in your charming post on this great nursery. 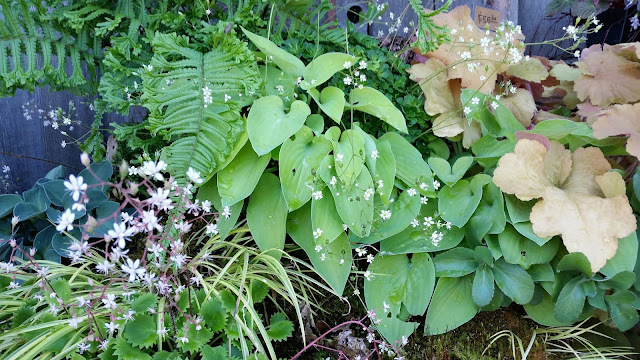 I did not know they introduced 'Rooguchi,' which I only know through photos of East Coast gardens. Oh, do you like it? I will do more if people are interested. Yes, how about that with Rooguchi? Also we've introduced new varieties of several plants - these folks are wonderful plant people. Great post, great photos, great place! You captured the spirit of the place so well, Tamara, I'm blessed to be a part of it all, thanks to you.